If you visited Playa del Carmen just a decade ago and came back today, you would probably find it unrecognizable. Gone is the sleepy fishing village and artists’ colony you remember, replaced by luxury boutique hotels, upscale designer stores, and American chain restaurants. Cerulean waters are no longer the only thing to beguile and beckon travelers to Playa. Long a favorite among European expats and vacationers, North Americans have also discovered its allure. In fact, many businesses on iconic 5th Avenue are owned by Europeans, Argentinians, and Americans. If you’re in need of a primer on the new Playa, here are ten reasons to keep coming back to this once idyllic paradise, turned luxury vacation destination. 1. Playa del Carmen is one of the top beaches in Mexico, situated in the middle of the captivating Riviera Maya that stretches from Cancun to Tulum. These days, fruity cocktails sipped under umbrellas, and adventurous water sports entertain beach-goers. Those looking to laze away the day on the beach will want to stick with the north end where they’ll be unimpeded by rising tides that affect the southern end of the beach. 2. Playa’s La Quinta Avenida (5th Avenue) remains a big draw for visitors, but for different reasons. Kitschy souvenir shops no longer dominate the 20-block pedestrian walkway that runs parallel to the beach. Now, an array of bars, restaurants, posh nightclubs, hotels, condos, hostels, and boutique stores mix with quaint souvenir shops to continue making this vibrant area a fun place to people watch. 3. Xcaret is Playa del Carmen’s highly touted eco-park. Though notably commercialized, you’ll find almost every kind of eco-adventure here that you can imagine. When you’ve finished exploring underwater cenotes or swimming with dolphins, enter the mysterious world of the Maya in Xcaret’s replica Maya village. Cap your day with a three-course dinner and musical extravaganza in the Gran Tlachco amphitheater. 4. One of the most stunning adventures you can undertake along the Maya Riviera is diving the Mesoamerican Barrier Reef, second in size only to the Great Barrier Reef off the coast of Australia. 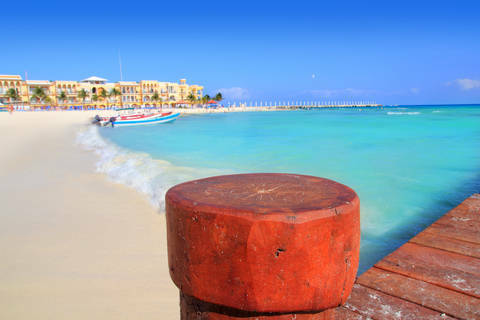 Playa del Carmen offers some of the best diving you’ll find in the Western Hemisphere. Stick close to the Cozumel side of the reef for a world class diving experience. 5. The nightly fire shows at the Blue Parrot are an experience you won’t want to miss. Each night after 10:30 p.m., highly skilled performers transform this beach-side nightclub into an electrifying light show that will astound you. Although you can catch the show for free just by lingering on the beach, why not have a beer and take in the actual show? The performers will appreciate it. 6. Now a favorite gastronomic destination, Playa is a mixture of Mexican, Maya, and European influences. There is something for every taste and budget. For the best Maya restaurant make your way to Yaxche; indulge in premier Mexican fare and margaritas at Luna Maya; and when the mood is Italian, everyone agrees on popular Casa Mediterranea. Go ahead and enjoy the high energy and excitement of crowded tourist attractions in Playa del Carmen’s hyper-chic areas, but when you’re ready to take it down a notch, explore the offbeat or lesser known sights around the city that put you in touch with the its authentic roots. It’s these moments that add layers to your vacation and make it one to remember. 7. A cozy and romantic dinner among the aluxes, tiny playful spirits, in a magical cave is an unforgettable culinary experience. That’s exactly what is in store at Alux Restaurant. Diners in tune with their extra senses have reported feeling the presence of these mischievous light bearers. 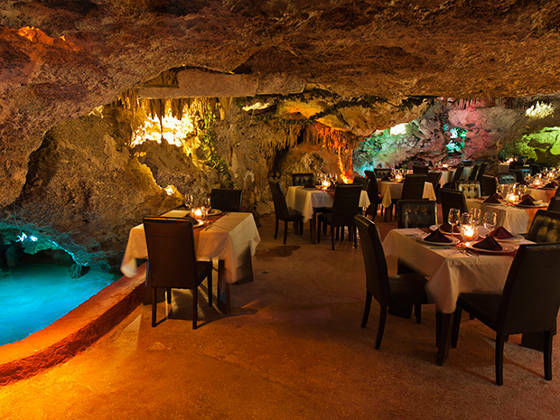 The mystical Maya ambiance of this cave is a charming backdrop to upscale Mexican and International cuisine. 8. Keep a sharp eye out for The Cigar Factory off 5th Avenue. Part cigar museum, part working cigar factory, it’s the ultimate “how to” experience of cigar-making. Push past the hanging fans of tobacco leaves to the back room where you’ll find over-sized bags of aromatic tobacco, empty cigar boxes waiting to be filled, and specialty labels ready to brand the finished products. Watch the delicate work of cigar and cigarillo rolling, and maybe leave with a box of your own. 9. While everyone else is diving the uber-popular Mesoamerican Barrier Reef, become a character in your own adventure novel while exploring the sacred underwater world of the cenotes. The grandest of them all is Rio Secreto, a system of caves purported to be the Maya doorway to the afterlife. A gift of beauty to behold, this is an experience you will definitely want to include on your bucket list. 10. AllTourNative offers exotic jungle tours that will thrill and test you. Bike jungle trails, explore Maya archaeological sites, learn purification ceremonies, zip-line z-wires, and snorkel cenotes. Get a taste of nature near Playa, as well as a glimpse of ancient Maya culture. These popular and little-known attractions are just ten reasons to visit Playa del Carmen. Old Playa may be gone, but you’ll love new Playa, Mexico’s hottest vacation destination. 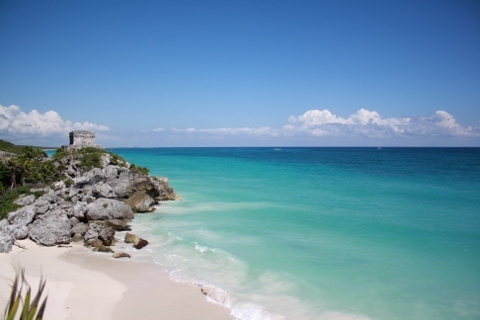 Some of the top-rated tourist attractions in and near Playa del Carmen, Mexico. Get the facts about entry requirements for U.S. citizens traveling to Mexico. Join in and write your own page! It's easy to do. How? Simply click here to return to Travel Article Submission.